The Abbreviated Patient List report is an Advanced Report that will list all patients in the database with select information. Account Number - the patient's account number, found under their Demographics. Name — The patient's first and last name. Phone Number — Lists home phone first, then cell phone, found under their Demographics. Address — The patient's street address from Demographics (specifically, the Street Address 1 and Street Address 2 lines). 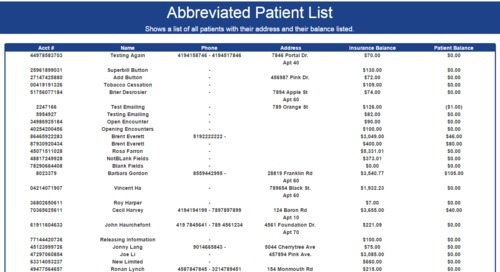 Insurance Balance — The remaining balance of any line items marked insurance responsible on any of this patient's encounters. This will match the Insurance filter on the patient's ledger. Patient Balance — The remaining balance of any line items marked patient responsible on any of the patient's encounters. This will match the Patient filter on the patient's ledger with the exception of unapplied payments, which will not be included on this report. This report has no filters. It will display all patients in TRAKnet with the exception of patients who have been deleted.